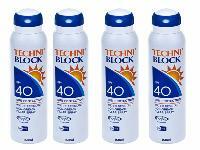 Techniblock® SPF 40 is the best sunscreen to prevent burning and reduce the symptoms of prickly heat! A well-known and trusted South African brand that has been protecting skin for over 10 years, Techniblock® is fully compliant in line with the EU's standards and regulations for sunscreens and offers broad spectrum, 5 star protection against the damaging and harmful effects of UV rays. Proven to reduce and prevent the symptoms of prickly heat - see our customer reviews! A light, modern formula that offers non-greasy, non-sticky, very water resistant all day protection for the whole family. Drying instantly on the skin to provide an invisible UV barrier, Techniblock contains photo-stabilisers to boost performance. It contains anti-oxidants to enhance the skin's natural defenses in the fight against the damaging and ageing effects of UV exposure. A single application can last for up to 6 hours without the need to re-apply, providing great value for money. It does not contain oils or emulsifiers, so it will not block pores or break down in water. Techniblock has an extended expiry date because it is packaged in a sealed and pressurised airtight container. Even after opening, the product remains fully effective and stable, meaning no waste. Developed and manufactured to the highest standards by Technikon Pharmaceutical Laboratories in South Africa, Techniblock is a CANSA Sun Smart Choice product. Did exactly what it said on the tin! Easy to apply, not messy, no sunburn and no prickly heat rash. I started using this product last year, I burnt badly whilst sailing, after a chemist brand let me down.Using Techniblock (RYA recommendation) I have not suffered again, and have found Techniblock easy to apply, quickly dried off and it works great (factors 50+ and 40SPF). This has been my first repeat order, now for the whole family. It arrived quickly, and with a bonus small tin, which I didn't expect after ordering two different factor tins. The only sunscreen I can find which prevents me getting prickly heat symptoms. Love this product. We use it year on year. Always happy with the effectiveness of the product, the speed of delivery and the valuable customer service. Thank you again. Have used this sunscreen for the last 5 holidays, it is the best in the world by far, love it, family loves it and it does the job in any heat at any time, waterproof and you can trust it at all times, unlike others this is the real deal and we have never burned at any time while using this great product, fantastic!! Reliable user friendly product. Flash dry formula has put paid to the complaints of sticky creams and runny eyes, from the children.